Exhibition Place locked out its unionized technical staff Friday morning with just a few weeks to go before the Canadian National Exhibition opens. 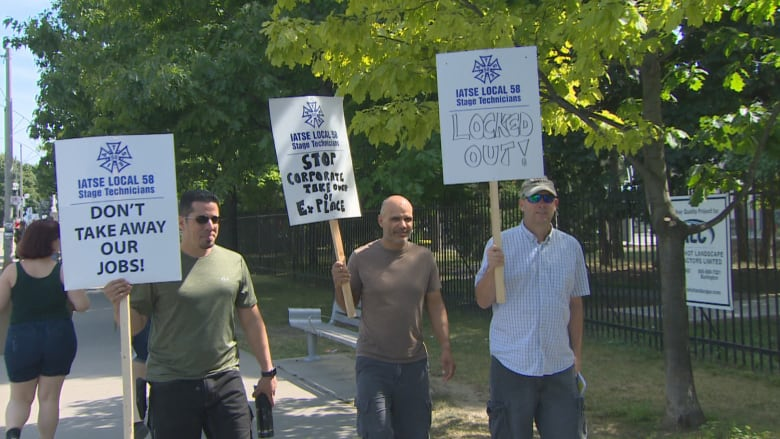 IATSE Local 58 workers began picketing Friday afternoon, just house after being locked out by Exhibition Place. Long-time technical staff and stage workers at Toronto's Exhibition Place have been locked out with less than a month to go before the opening of the Canadian National Exhibition — a move their union is calling "a slap in the face." 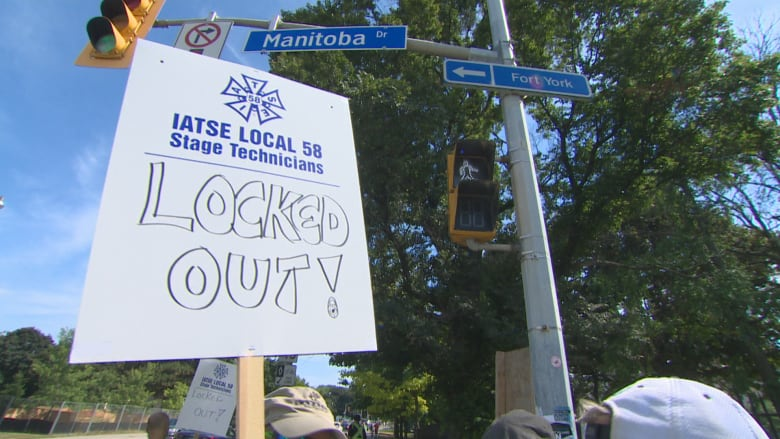 The lockout of IATSE Local 58 workers officially began Friday morning, and workers began picketing Friday afternoon. They say that if they don't get a deal by the time the CNE opens on Aug. 17, people who want to go to the fair will have to cross their picket line. Local 58 president Justin Antheunis says the city is trying to "eliminate" unionized workers "from the jobs we've been doing for decades" in a bid to cut costs. "After all of the events that Local 58 has worked on, from the Pope, to the Queen, and Bill and Hillary Clinton, this is a slap in the face from the employer, to say that they're not valued as employees down there," Antheunis said. "They'd rather have someone else do our job." The union represents skilled workers who also provide staging services and technical support at venues such as The Air Canada Centre, Massey Hall and Roy Thomson Hall. Local 58 employees also work at the city-owned Exhibition Place grounds for events at BMO Field, and annual events like the recent Honda Indy Toronto. 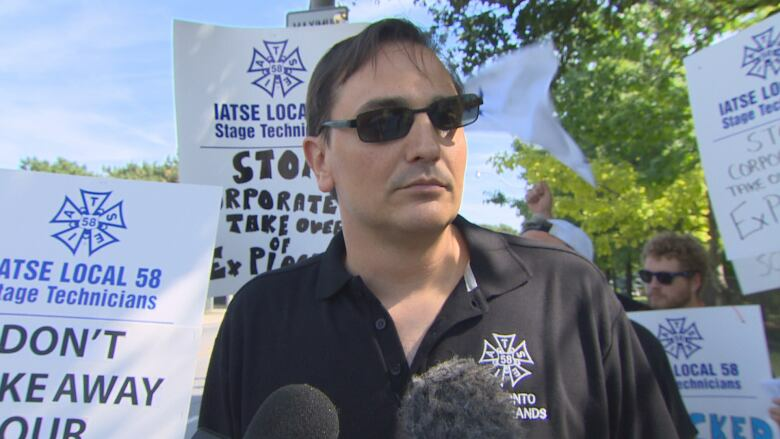 Justin Antheunis, president of the IATSE Local 58, is accusing the city of trying to push out the union and replace his members with non-unionized labour. Exhibition Place board members are appointees of Toronto Mayor John Tory, and union reps would like to see Tory held accountable for what they consider a lack of progress for negotiations. "If Mayor Tory wanted to see labour peace, he could have instructed the board of governors to make sure there was labour peace, but he didn't do that," Antheunis said. "His silence is deafening on this situation." The chair of the Exhibition Place board, Coun. Mark Grimes, says the lockout is the culmination of eight months of unsuccessful negotiations with the union. "Exhibition Place has gone through major changes in the last couple of decades, but the collective agreements haven't kept up with that," said Grimes. "We're not competing worldwide. So, it's very important that we're competing ... and have the best possible rates for our shows, for our stakeholders and our clients." How will the lockout affect the CNE? Antheunis says he's sorry the CNE has been caught in the middle, but although he continues to hold out hope for a deal before the fair opens, he's skeptical of the city's contingency plans for running the event without his members. If a deal can't be struck by the fair's opening night, union organizers are hoping their picket lines will be respected by non-unionized workers. "The fight that we do as a union affects everybody. By weakening the union, they're also weakening their position in the city as well," said Antheunis. Locked out workers at Exhibition Place say they might confront fairgoers entering the CNE grounds if there's no deal before the Ex opens on Aug. 17. Fans of the Toronto Argonauts have also been warned by city officials not to drive down to games at BMO Field, citing increased commute times because of pickets. Also, if a deal isn't reached by the start of the CNE, union officials warn fairgoers could be met by pickets as they enter the grounds. Grimes says no matter what time of year, a lockout at Exhibition Place will inconvenience people. "There no good time to have a strike or a lockout, but these issues have been going on for years, he said." "If it's not the CNE, its the Royal Winter Fair. If it's not the Royal WInter Fair, it's the Boat Show." Antheunis says although Local 58 is hoping for a speedy deal, there are issues the union won't budge on. "As long as they want to have non-unionized employees doing the work that Local 58 has been doing for decades, we can't even sit down at the table for that."